Derrick is a tenured software engineer who is driven by the desire to learn and create. 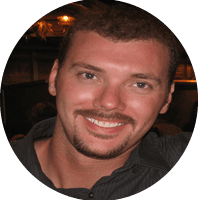 He strives for excellence through collaboration and curiosity, and finds himself equally at home in front of a keyboard and on the sunny beaches along the Gulf of Mexico. After an educational foundation in computer science and programming, Derrick found his passion in developing for the web, and has been helping his teams innovate ever since. When not hard at work, he can be found making delicious messes in the kitchen, doing his best to catch ballgames, and exploring the local sights and sounds with his better half, Brandi.